Learn three reasons why the oil crash and market correction offers the perfect opportunity to buy one of the best high-yield MLPs. As a value-focused dividend investor, I'm absolutely loving this oil crash and market correction. No, I haven't taken leave of my senses. I'm merely thrilled at the opportunity to "be greedy when others are fearful." I've spent the past few weeks and months watching some of my favorite high-yield midstream MLPs drop precipitously, often because of nothing more than irrational market fear. One of the investments I'm most excited about, and plan to add to my own real money portfolio, is Magellan Midstream Partners (NYSE: MMP). 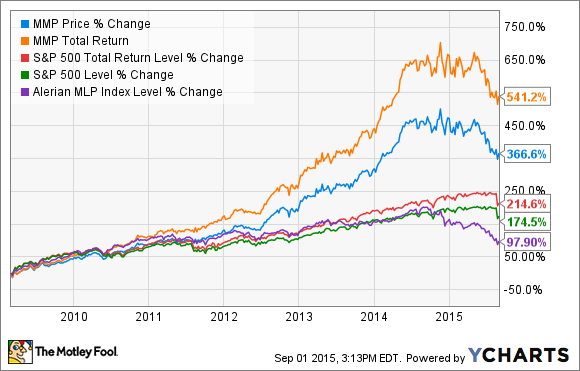 Let me explain three reasons I think Magellan deserves to be on every long-term income investor's radar, and possibly in your diversified dividend portfolio as well. Since the depths of the financial crisis, Magellan has absolutely crushed both its MLP competitors and the market in general, and for good reason. Simply put, Magellan's management is among the pantheon of the greatest minds in its industry, eager and able to make bold, opportunistic investments that allow it to maximize long-term distribution growth and investor value. Case in point: Back in March of 2009, as things looked the bleakest and the financial crisis was at its peak, Magellan bought out its general partner -- and the GP's incentive distribution rights -- permanently lowering its cost of capital, and greatly increasing its future distribution growth potential. Similarly in 2010, after the BP oil spill in the Gulf of Mexico, when the oil giant was at its most desperate and willing to cut generous deals to raise money, Magellan jumped in to buy $289 million worth of prime storage and pipeline assets. That included 7.8 million barrels of oil storage capacity in Cushing, Okla., the heart of America's oil boom, and where West Texas Intermediate oil is priced. At an enterprise value/EBITDA ratio of 18.6, Magellan still isn't super cheap, despite falling 22% since its high back in late November 2014 to its lowest level in almost 18 months. For an MLP of this caliber, you have to be willing to pay a premium over lesser pipeline operators. However, if you compare Magellan's current valuation against where it's traded historically, you can see why I'm so excited about the current price. 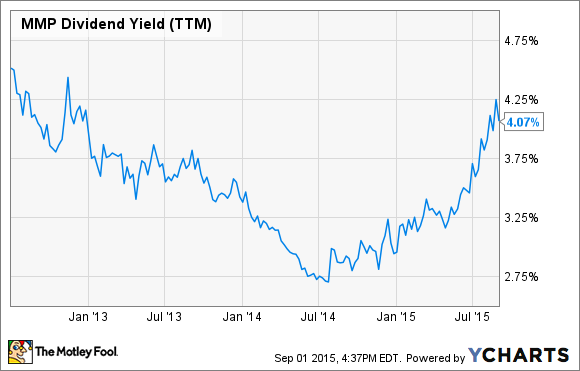 Magellan's yield is at its highest in almost three years. Better yet, that distribution is rock solid, protected by long-term, fixed-fee contracts that insulate 85% of Magellan's 2015 operating margin from volatile commodity prices. In fact, despite the oil crash, in its latest quarter management raised its 2015 distributable cash flow--DCF--guidance by $10 million, to $880 million. That means that not only will Magellan probably sport a 2015 distribution coverage ratio of 1.3, but it will also generate around $200 million in excess DCF, cash that can be used to fund its bevy of highly profitable growth projects. Speaking of which, Magellan just increased its growth spending by $200 million to $1.4 billion over the next two years, $850 million to be completed in 2015 -- $620 million of which in the second half of the year -- and $550 million in 2016. It's also evaluating well over $500 million in additional potential investment projects. Magellan also boasts a strong balance sheet and $1 billion in cheap credit -- at one-year borrowing costs of 1.8%-2.6% -- it can tap for opportunistic acquisitions; such as a $55 million refined product terminal it recently bought outside Atlanta. Magellan is committed to growing its payout 15% in 2015 and at least 10% in 2016, all while maintaining a sustainable long-term distribution coverage ratio of at least 1.1. Based on its strong pipeline of growth projects, I have little doubt that Magellan will be able to hit those distribution growth targets. Midstream MLPs almost always get whacked when oil prices crash, and most of the time it's an overreaction. Their predictable and commodity insensitive cash flow, backed by long-term fixed-fee contracts, and new growth projects coming online often make them great high-yield investing opportunities at those times. I believe this to be the case with Magellan Midstream Partners, whose superb management team has proved it can maintain and grow the distribution in economic and commodity conditions far worse than exist today. Thus, I'd urge all long-term income investors to consider adding this gem of a pipeline operator to their watch list, or better yet, to buy some for their diversified income portfolio today. I'm highly confident that when the dust settles, the markets calm down, and oil prices finally recover, you won't be disappointed in the results.